This illustration shows the possible interior of the Saturn moon Enceladus. Data gathered by NASA’s Cassini probe suggests Enceladus has an ice outer shell and a rocky core with a regional water ocean sandwiched in between at high southern latitudes. Saturn's icy moon Enceladus is looking better and better as a potential abode for alien life. Chemical reactions that free up energy that could potentially support a biosphere have occurred — and perhaps still are occurring — deep within Enceladus' salty subsurface ocean, a new study suggests. Astrobiologists regard the 314-mile-wide (505 kilometers) Enceladus as one of the solar system's best bets to host life beyond Earth. The satellite is covered by an icy shell, but it's geologically quite active, as evidenced by the powerful geysers that blast continuously from its south polar region. These plumes contain significant amounts of water, which scientists think originates from a subsurface ocean. Previous studies have suggested that this ocean is in contact with Enceladus' rocky mantle, making possible all sorts of interesting chemical reactions. The new paper, published Wednesday (May 6) in the journal ‪Geochimica et Cosmochimica Acta, further supports that notion. The researchers studied mass-spectrometry measurements of the gases and ice grains in Enceladus' plumes made by NASA's Cassini spacecraft, which has been orbiting Saturn since 2004. The team used this information to develop a model that estimates the saltiness and pH of Enceladus' plumes, and, by extension, the moon's underground ocean. Enceladus' subsurface sea contains dissolved sodium chloride (NaCl) — run-of-the-mill table salt — just as Earth's oceans do, researchers said. But it's full of sodium carbonate (Na2CO3), which is also known as washing soda or soda ash, as well. So this alien water body is probably more similar to terrestrial "soda lakes," such as ‪Mono Lake in California, than it is to the Atlantic and Pacific oceans, study team members said. Such inferences shouldn't dishearten astrobiologists; a variety of lifeforms thrive in Mono Lake, including brine shrimp and many different types of microbe. And the new study provides other reasons to be optimistic about Enceladus' life-hosting potential, researchers said. 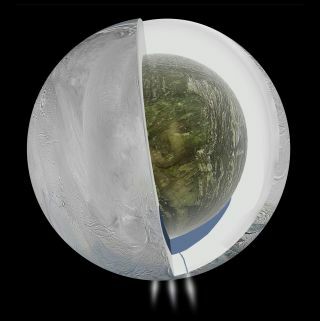 For example, the team's model suggests that the subsurface ocean's high pH is generated by a process called serpentization, in which certain kinds of metallic rocks from Enceladus' upper mantle are transformed into new minerals (including serpentine, hence the name) via interactions with water. In addition to raising pH, serpentization results in the production of molecular hydrogen (H2) — a potential source of chemical energy for any lifeforms that may exist in the underground sea, researchers said. ‪"Molecular hydrogen can both drive the formation of organic compounds like amino acids that may lead to the origin of life, and serve as food for microbial life such as methane-producing organisms," study lead author Christopher Glein, of the Carnegie Institution for Science in Washington, said in a statement. Sunlight probably doesn't flow through Enceladus' underground sea, but any microbes that exist there may thus have access to two different sources metabolism-supporting energy sources — molecular hydrogen and the heat provided by hydrothermal vents.